For healthy, clear and glowing skin, it is important to take off your makeup before you go to sleep each night. Makeup remover wipes are convenient and easy to use, but are wasteful and often full of harmful ingredients. 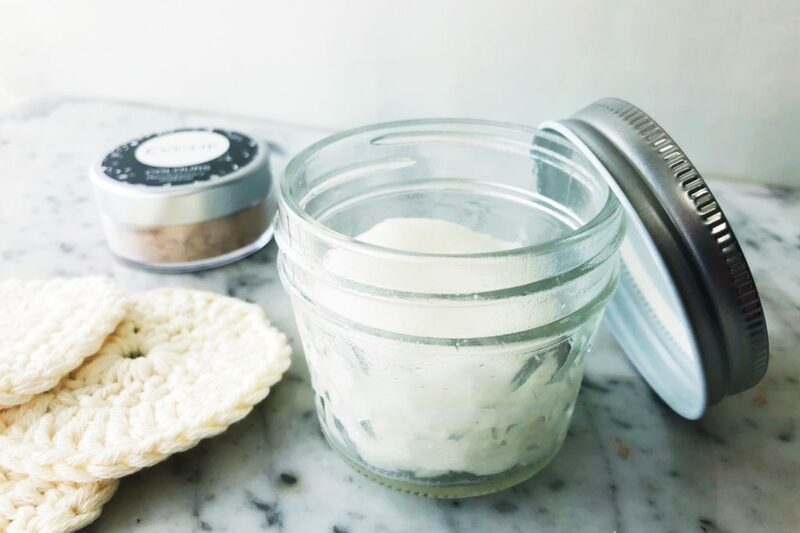 But what if you could make your own makeup remover pads using simple, natural ingredients, which can be stored in a reusable glass jar and, most importantly, worked just as well? Read on as we show you how. Make this zero waste! You can use single use organic cotton cosmetic pads for this recipe and compost the pads after use. Or use reusable cosmetic pads that you can wash and use again. You might like to crochet your own like we did here, or make some out of an old towel or piece of fabric. Place cotton pads in the glass jar. In a small bowl, mix the fractionated coconut oil, castile soap and essential oils together. Pour the fractionated coconut oil mixture over the cotton pads, and press down on the pads so that the mixture absorbs evenly. Pour just enough distilled water over the pads to wet them. Not too much though, as you don’t want the pads to be dripping wet when you remove them. Place the lid on the jar and shake (this will help to evenly distribute the liquid over the makeup remover pads ). Use one makeup remover pad at a time. Swirl over face to remove make up and dirt. Keep your eyes closed as castile soap may sting your eyes if you get it in them. Keep the lid on the jar to prevent the pads from drying out. Biome cannot issue a refund if the DIY skin care product, DIY hair care product or DIY body care product you make using our raw DIY ingredients do not perform as you’d hoped. We will, however, offer a refund if the raw DIY ingredient packaging is broken or leaking, or the ingredient itself appears to be ‘off’. Before using any raw DIY ingredient for the first time, please first research that ingredient’s potential benefits as well as safety precautions and possible side effects. Check with your medical professional if you have any concerns. If you have severe acne, very sensitive skin, or another skin concern or health condition, we recommend seeking medical advice before using any new product on your skin, whether that be a raw ingredient, a DIY product you’ve made yourself, or a commercially formulated product. Please exercise caution when using essential oils. If you are pregnant or have any kind of health or skin condition, we recommend you speak to your doctor before use. Essential oils are highly concentrated liquids, so use in moderation. Pure essential oils should never be used directly on the skin and should never be ingested. When using an essential oil for the first time, do a skin patch test. Each essential oil is unique and may not be suited to everyone. Please research potential benefits as well as safety precautions before using any essential oil. Some essential oils may interfere with medication. Check with your medical professional if you have any concerns.